Embark on a once-in-a-lifetime journey with your betrothed to a tropical paradise to experience an unforgettable wedding story. Delight in the pleasures of an exclusive private island wedding in Jamaica that you and your loved ones will remember for the rest of your lives. Brilliant white sand beaches, sparkling blue waters, majestic landscapes, and a balmy Caribbean breeze make Couples Tower Isle a coveted destination for lovers to exchange their vows while surrounded by close friends and family. This exclusive destination, paired with our signature ‘Private Island Wedding’ package, makes it possible for couples to have the luxurious and stress-free destination wedding of their dreams. Situated in the heart of the Caribbean surrounded by dazzling turquoise waters lies the picturesque Couples Tower Isle, a postcard-perfect dreamscape featuring white crystal sand, vibrant landscape and an elegant backdrop for a romantic private island wedding in Jamaica. Our signature Private Island Wedding package boasts a guaranteed stress-free and purely indulgent wedding experience allowing newlyweds to cherish every blissful moment while guests enjoy the spoils and grandeur of an exclusive tropical paradise. Reflect your tastes and life story by customising your wedding with a variety of artful and personalised touches designed to make your special day all the more memorable. With a variety of fresh local blooms, live entertainment, reception enhancements, and professional photography/videography packages, Couples Resorts will customise each wedding to best suit the needs of every couple and their budget. Enlist the aid of our Romance Concierge or peruse the list of Romantic Touches to make your special day even more enchanting with extravagant honeymoon packages featuring luxurious couple spa treatments, elegant candlelight dinners on the beach, fresh tropical flowers, and more. By planning around 400 weddings a year across all hotels, our wedding planners have become experts in making your dream destination wedding a reality – from preparing a menu of delicious Jamaican foods to arranging a steel band to regale your guests. Be it intimate celebrations or extravagant affairs; we cater to every bride and groom to ensure their unique style is incorporated into the wedding, from the colour scheme and floral arrangements to the ceremony and reception. The details make the difference, and we’ve thought of it all. At Couples Resorts we believe in doing our utmost best to provide lovers with a ceremony that exceeds every expectation. Just sit back, relax and let our expert wedding planners take the stress out of planning your special day. 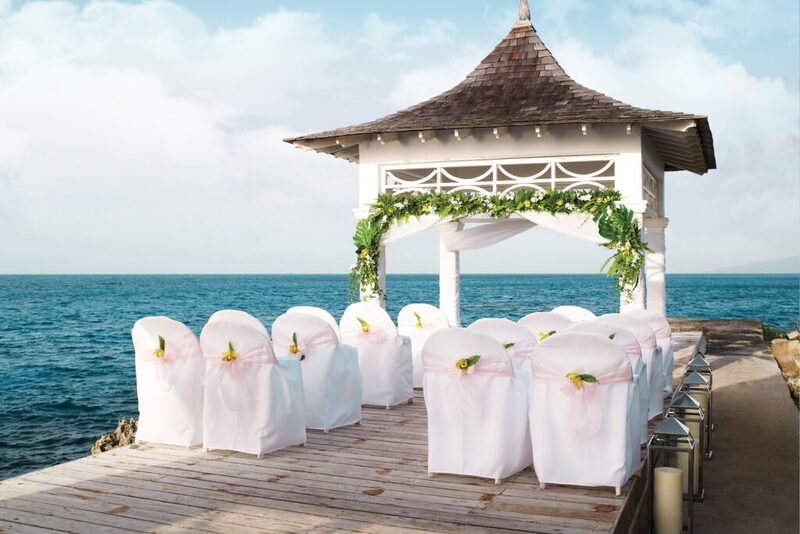 Get swept away in our mesmerising couples oasis and begin your marital journey with a private island wedding in Jamaica. Contact our wedding planning consultants today and make your dream destination wedding a reality.